Featuring seven tales from the 13th Century Sufi poet Rumi's Masnavi, Rumi x 7 fuses classical Persian poetry with circus arts and commedia dell arte. 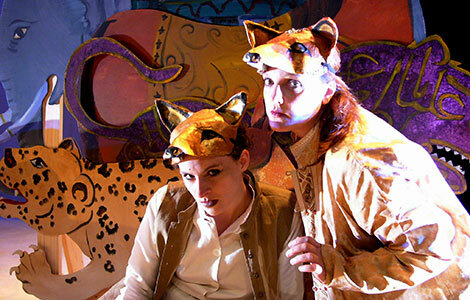 Performed by a seven-member ensemble of actors, acrobats, musicians and dancers, the fables include familiar tales such as The Elephant in Darkness and The Grammarian and Boatman, as well as lesser-known gems. Together they celebrate the cycle of life and humanity's universal bond. READ MORE. Mantiq-At-Tair (Conference of the Birds) is a 12th century allegorical fable composed by Farid Ud-din Attar, the Persian author of two hundred thoursand verses and many works in prose. Each bird-form serves as an emblem for the different characteristics of man, reminding us of our frailty and misguided priorities. The fable is a celebration of man's triumph over his tribulations. READ MORE. Once upon a time storm winds cast a ship of men from diverse nations on the shore of an island inhabited by animals living in peace and harmony. The men hunted the animals, convinced they held dominion over them. The animals then took their grievance to the wise King of the Jinn presiding over The Case of Animals versus Man. 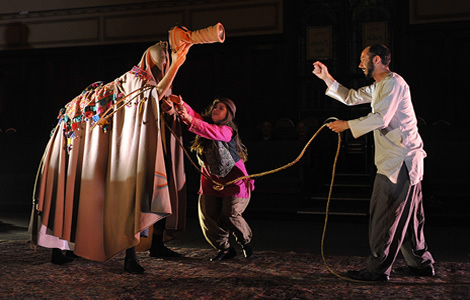 Adapted from the writings of the 10th Century philosophers, Ikhwan al-Safa, the production fuses western and eastern theatrical traditions. READ MORE.